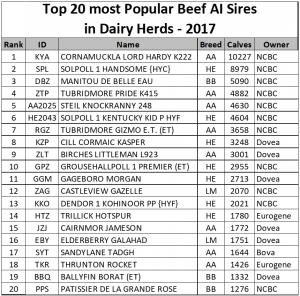 What Was The Most Popular Beef AI Sire In 2017? 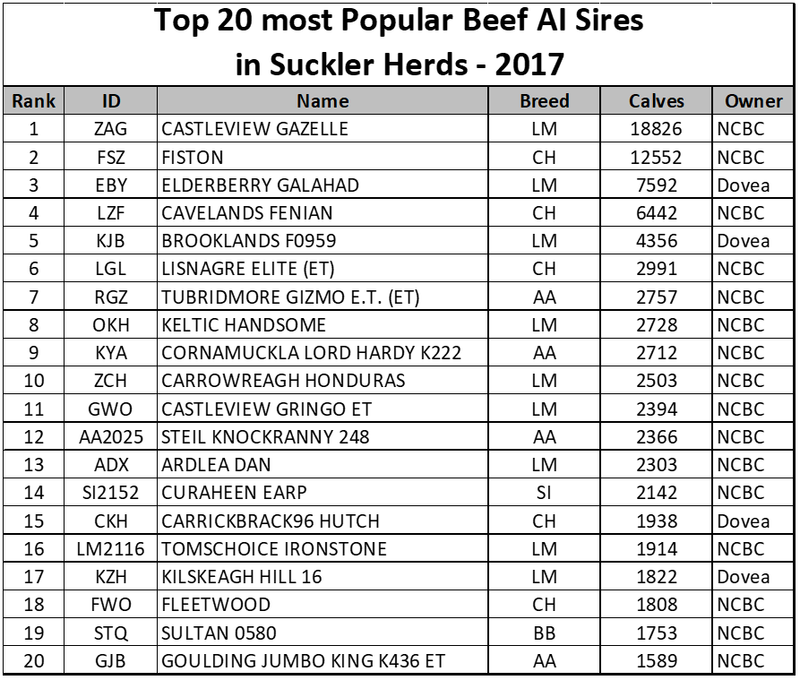 The Irish Cattle Breeding Federation (ICBF) recently released data outlining the top 20 most popular beef AI sires in suckler herds in 2017. Castleview Gazelle (ZAG), Fiston (FSZ) and Elderberry Galahad (EBY) booked the top three spots with 18,826, 12,552 and 7,592 calves respectively on the ground. 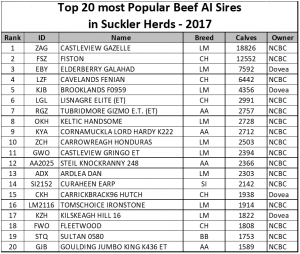 What’s interesting is that Limousin and Charolais sires sit in the top six positions, with Cavelands Fenian (LZF), Brooklands F0959 (KJB) and Lisnagre Elite (LGL) taking the fourth, fifth and sixth positions. Angus bull Tubridmore Gizmo (RGZ) took seventh place with 2,757 calves on the ground, while Keltic Handsome – a Limousin bull – was the eight most popular beef AI sire with 2,728 calves. Another Angus bull, Cornamuckla Lord Hardy K222 (KYA) sired 2,712 calves in the suckler herd to put him in ninth place – over 200 calves ahead of the next most popular bull Carrowreagh Hondurus (ZCH). The remaining 10 bulls consisted of four Limousin sires (GWO, ADX, LM2116 and KZH), two Angus sires (AA2025 and GJB), two Charolais bulls (CKH and FWO), one Simmental bull (SI2152) and one Belgian Blue sire (STQ). In total, some 83,488 calves were born after the bulls falling into the top 20 positions in terms of AI popularity. Limousin-sired calves accounted for 44,438 (53.2%), Charolais-sired calves stood at 25,731 (30.8%) and Angus-sired calves represented 9,424 (11.3%) of the total. 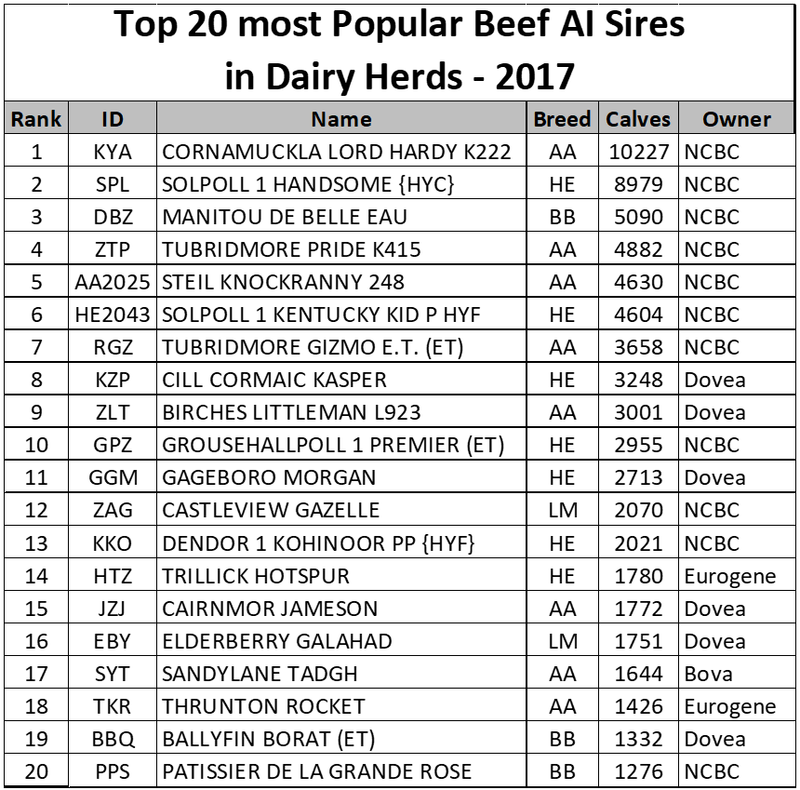 The ICBF also generated statistics on the 20 most popular beef AI sires used in the dairy herd in 2017. Cornamuckla Lord Hardy K222 (KYA), Solpoll 1 Handsome (SPL) and Manitou De Belle Eua (DBZ) took the top three placings with 10,227, 8,979 and 5,090 calves respectively. In addition, Tubridmore Pride K415 (ZTP) and Steil Knockranny 248 (AA2025) filled the fourth and fifth positions, with 4,882 and 4,630 calves respectively.